The browser maker is touting 'Facebook Container' as a way to wall off users' Facebook activities – a new bid to attract the privacy conscious. In the midst of news that Facebook CEO Mark Zuckerberg will testify before Congress to answer questions about his company's data collection and sharing practices, Mozilla has begun pushing a Firefox add-on to make it harder for the social network to track users once they leave its site. "Facebook Container isolates your Facebook identity from the rest of your web activity," Nick Nguyen, Mozilla's product strategist, wrote in a Tuesday post to a company blog. "When you install it, you will continue to be able to use Facebook normally. Facebook can continue to deliver their service to you and send you advertising. The difference is that it will be much harder for Facebook to use your activity collected off Facebook to send you ads and other targeted messages [emphasis added]." "If used carefully, Containers can prevent tracking. If a site is only opened in one Container, cookies set on that container cannot follow the user to other sites visited in non-container tabs or other containers," Mozilla stated in a backgrounder about the technology. Facebook Container is, at root, a customized version of the earlier add-on, as Mozilla explained in another, albeit unsigned, blog post Tuesday. "When you install this extension, it will delete your Facebook cookies and log you out of Facebook," the company noted. "The next time you visit Facebook it will open in a new blue-colored browser tab (aka 'container tab'). In that tab you can login to Facebook and use it like you normally would. If you click on a non-Facebook link or navigate to a non-Facebook website in the URL bar, these pages will load outside of the container." 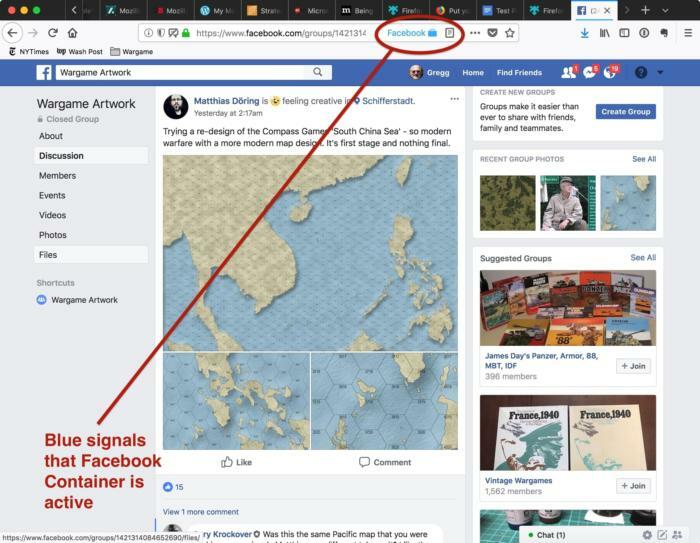 Facebook Container signals it's active by shading the name of the service, as well as drawing a thin blue line under the tab. But while Mozilla capitalized on the turn against Facebook among some users - evidence highlighted by the #deletefacebook campaign - it admitted that the Container add-on would not have helped in the latest instance. "The type of data in the recent Cambridge Analytica incident would not have been prevented by Facebook Container," acknowledged Mozilla's Nguyen. "But troves of data are being collected on your behavior on the Internet, and so giving users a choice to limit what they share in a way that is under their control is important." Elsewhere, Mozilla pointed out the downsides of adding Facebook Container to Firefox. Among the issues with Facebook: Users may not be able to log in to other sites or accounts with their Facebook credentials, and "Like" buttons offered by non-Facebook websites will not work. The Facebook Container can be downloaded and installed into Firefox from this page of the Firefox Add-ons market. Mozilla has long touted its browser as the best choice for the privacy minded, with the pitch's credibility dependent, at least in part, on the fact that unlike Google (and its Chrome), Mozilla's business model does not directly rely on monetizing user data via targeted ads. (Mozilla certainly indirectly leans on just that; the bulk of its revenue comes from setting Google as Firefox's default search engine.) The open-source developer repeated the privacy talking points as it rolled out Facebook Container. "This add-on offers a solution that doesn't tell users to simply stop using a service that they get value from," Nguyen said. "Instead, it gives users tools that help them protect themselves from the unexpected side effects of their usage."